At New Beginnings TLC, Inc.we believe that every individual should be comfortable in their body, life and community and have equal access to support, healthcare and community services. 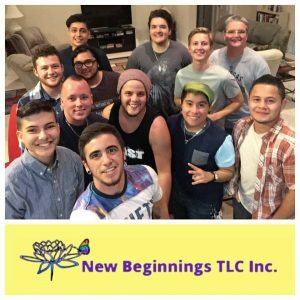 It is the mission of New Beginnings TLC, Inc to support LGBTQ individuals through all phases of their journey. We provide support and education for those coming to terms with their gender identity or experiencing difficulties as a result of their gender identification; we provide direct assistance to those making physical transitions; we provide advocacy and support for LGBTQ in the community. Thank you for welcoming us & letting us be a part of an amazing place. This took me and the journey of transformation to a new level. The friends I met here, I hope to keep in contact with My advice to new people entering the doors of this home is lay your baggage down, even emotional baggage. This is about you, this is your time, you were brought here for a reason. Take peace in that, and remember what really lies within your shell." The retreat provides a safe and comfortable place for you to recover from top surgery. You'll be in the company of others who are sharing the same experience, allowing you to form close, life-long friendships. Our experienced staff is here for you and provides transportation to all medical appointments. Now partners with Trader Joe's, you will find organic food in abundance for your cooking pleasure. Your safety and peace of mind are vital to your recovery. Recovering with us takes away all your stress and worries. Not only are our rates comparable to a hotel, we provide you with basic supplies and transportation, saving you a lot of cash. New Beginnings is run with plenty of TLC! Leland has over 20 years of nursing experience, and Bonnie is a life coach and has been a pain management therapist since 1989. With so many wonderful local restaurants to enjoy dining in or take out, it's our pleasure to provided menus and suggestions for everything from Sushi to Tacos. For those who love animals, our resident therapy girls Molly and Gidget (two sweet hypoallergenic Yorkies) and Daisy (an enthusiastic and social Senegal Parrot) are our personal girls, in case you hear barking! A recliner is a necessity when recovering from top surgery, since you can't immediately lie flat. We provide a cozy recliner in every bedroom as well as in common areas. Nothing beats recovering in the company of others who are sharing the same experience. At New Beginnings, you will have the opportunity to create strong, lifelong friendships while you recover. Traveling can be stressful when you aren't familiar with the area. We pick up you up from the airport, get you to your appointments, pick up prescriptions, and get you back to the airport hassle-free.